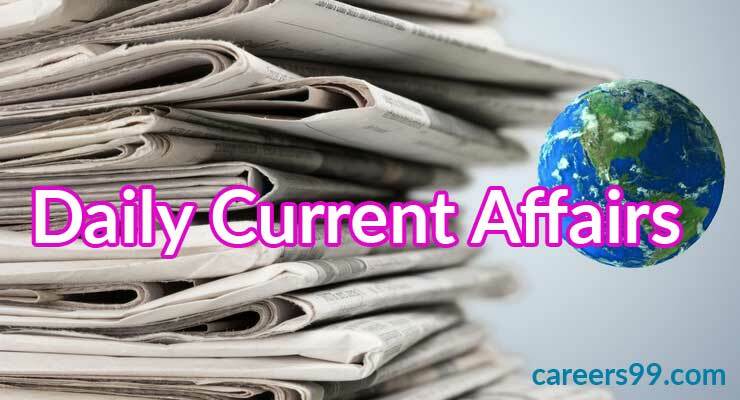 Here is yours today GK Daily Current Affairs of 17th August 2018. The candidates who are going to participate in the upcoming exams like banking exams, government jobs etc. We are helping to bring out the daily GK Current Affairs of August 17th, 2018. Check the current affairs and questioning yourself and check your preparation level. You can also check the yesterday current affairs and attempt a maximum 20 bits correctly. In the wake of Prime Minister’s vision for creating digital museums at stations using QR code, Ministry of Railway has made “digital screens”operational at 22 stations on this Independence Day as an innovative low-cost solution to spread awareness among the public about the opulent heritage of Indian Railways. Radha Mohan a Union Minister of Agriculture and Farmers singh to Jose Graziano da Silvato declare UNFAO (United Nations Food and Agriculture Organisation) for the upcoming year of International Year of Millets. China, in Beijing the 24th World Congress of Philosophy was held. It was conducted by the International Federation of Philosophical Societies adn peeking University. The main theme is to Learning to be Human. This was the 1st time that the quinquennial event and it was held in China. US secretary of state, Mike Pompeo announced the formation of the Iran Action Group (IAG) to coordinate and run the country’s policy towards Iran. Pompeo has named Brian Hook, the State Department’s director of policy planning, as the group’s head. The aim behind the formation of IAG is to change the Iranian regime’s behaviour. Qatar King Sheikh Tamim bin Hamad Al Thanihas pledged to make direct investment in Turkey and announced a 15-billion US dollar investment into the country’s financial markets and banks. The announcement came after holding talks with Turkish President Recep Tayyip Erdogan in Ankara. Turkey is currently grappling with a currency crisis and heightened tensions with the United States, its NATO ally. Roshni Nadar, CEO and executive director at HCL, ranks secondin the list with an estimated wealth of Rs30,200 crore. She also heads the Shiv Nadar Foundation. The chairperson of the Times Group, Indu Jain, ranks third in the list. Her wealth is estimated at Rs26,240 crore. Aretha Franklin died at the age of 76 years. She was the US Singer and she was born in Memphis, Tennessee she made her debut in 1961. Her style and respect and natural woman attracted all the fans overall the world. PhonePe announced entering into a partnership with Indian Railway Catering and Tourism Corporation (IRCTC)to facilitate convenient, fast and secure payments through PhonePe on the IRCTC Rail connect Android app. The partnership will enable PhonePe’s 100 million-plus users to now pay directly from their bank accounts using UPI, credit and debit cards and also the PhonePe wallet for their travel bookings. Colorado Party’s Mario Abdo Benitezwas sworn in as the new President of Paraguay for a five-year term. Ibraham Boubacar Keita re elected as a mali president for the 5 years. Keita at 73, picked up 67.17% of vote against 32.83% for ooposition challenger and former finance minister Soumaila Cisse 68, who also ran aganist Keita in 2013. IAS officer K S Srinivashas taken over as Chairman of Marine Products Export Development Authority (MPEDA).